Today, when you order "Kenton's Full House by Kenton Knepper - DVD", you'll instantly be emailed a Penguin Magic gift certificate. You can spend it on anything you like at Penguin, just like cash. Just complete your order as normal, and within seconds you'll get an email with your gift certificate. 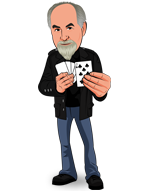 Kenton is so well known for his mentalism, reading and hypnosis that it is easy to forget that he is a killer magician. Kenton is an especially adept and creative card man. The routine that stands out is his slightly gimmicked, four card, 3 Card Monte that leaves you clean with 3 cards. He calls it Slo Mo Monte and it's a very clever and funny routine. The other winner on here is his sponge ball routine. I've seen a lot of sponge ball routines and this is one of the absolute best out there.